156 Pakistanis To Participate In US Fullbright Studies And Research: American Embassy Chargé d’Affaires John Hoover and Assistant Secretary of State for the Bureau of Educational and Cultural Affairs Marie Royce spoke to 156 Pakistani Fulbright Scholarship recipients preparing to leave for the U.S., where they will pursue advanced studies and research. The Fulbright Program is the American government’s flagship academic exchange program, and, thanks to contributions by both the American and Pakistani governments, Pakistan’s program is one of the largest in the world. 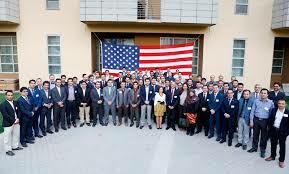 The Pakistani participants will attend 70 U.S. universities to study and conduct research in a wide variety of academic disciplines, including engineering, social sciences and energy management. The Chargé d’Affaires congratulated the students on being selected for the prestigious program but told them to begin thinking about how they can help pakistan when they return. “What you do next is what truly matters,” he said. “How you take the knowledge you’ll gain in America—whether from textbook, your professors or the everyday challenges of life—and use it to benefit all of society will determine where life takes you. ” Noting that “the President has said that we must empower women as pillars of our society and of our success,” Royce emphasized that 46 percent of this year’s students are women. She also singled out the work of Fulbright alumna Dr. Najma Najam, who founded Fatima Jinnah Women’s University and helped create “the next generation of the country’s women leaders.” Since 1946, the Fulbright Program—which is administered by the U.S.
Educational Foundation in Pakistan (USEFP)—has provided more than 370,000 participants from around the world the opportunity to conduct research, implement skills and ideas, teach, and contribute to society. To learn more about the Fulbright Program and about U.S. education initiatives in Pakistan, visit usefpakistan.org and pk.usembassy.gov.